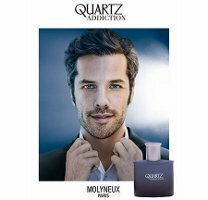 Molyneux Paris has launched Quartz Addiction, a new spicy oriental fragrance for men. Quartz Addiction is a flanker to 1994's Quartz Pour Homme. The notes feature mandarin, orange, pomelo, rose, cinnamon, spices, patchouli, amber and leather. Molyneux Paris Quartz Addiction is available in 30, 50 and 100 ml Eau de Parfum.